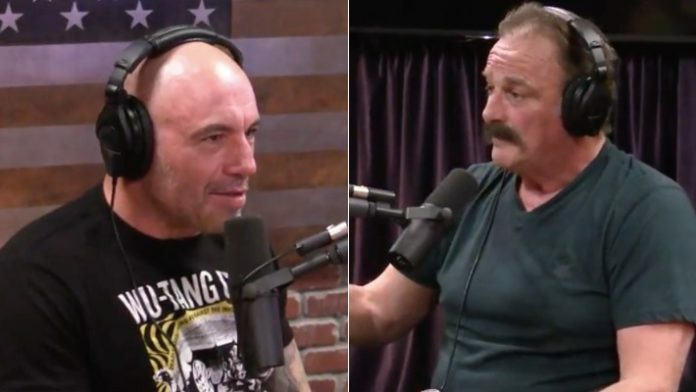 Jake “the Snake” Roberts appeared on the Joe Rogan Experience today. The WWE Hall-of-Famer didn’t hold anything back. He talked about his addiction and 3-year rehabilitation program with “Diamond” Dallas Page. Jake is in a good place now and credits his good health and fortune to the work of Diamond Dallas Page and his DDPY program. Jake also mentioned things could have turned out much differently for him had he not had a successful WWE career, however. Jake would continue to say that life meant nothing to him at the time. He felt confident he would have killed someone to feed his addiction if he had needed to. Roberts moved in with Diamond Dallas Page in 2012. By the time the DDPY team was confident enough in Roberts that he could be on his own, 3 years had passed. He relapsed 4 times while living with Page. He was also honest about having been sexually abused as a child, something he’s talked about on speaking tours previously. His father, Grizzly Smith, has been accused of some truly terrible crimes, including sexually abusing Jake’s sister, and former WWF Women’s Champion, Rockin Robin as a child. The Raiders QB was nicknamed Kenny “the Snake” Stabler and Roberts said he liked the fact Stabler liked to party and he liked the nickname. Jake continued to say Mid-South wouldn’t allow him to bring a snake to the ring, however. He would have to wait until signing with WWF in 1986 before he was able to do so. As per any Joe Rogan show, they get side-tracked quite a bit. Noted wrestling fan and comedian, Tony Hinchcliffe also appeared on the show.